When catastrophes strike, organisations may 'fall apart'. Managers may try to prevent the 'breakdown' and sustain operations, but in the aftermath of a disaster, no simple 'fix' may restore the previous order. A mechanistic-view of organisations leaves managers ill-equipped to handle the consequences of an unexpected event, yet it remains a common view in spite of Black Swan events. In Nassim Nicholas Taleb's book The Black Swan: The Impact of the Highly Improbable, he shares how Europeans once assumed all swans were white until one day in 1697 a Dutch explorer discovered a black swan in Australia. The now infamous metaphor of the black swan signifies the drastic shifts that take us by surprise and challenge our underlying models of reality. For managers who prefer the comforts of 'clockwork' the Industrial Age metaphor of an organisational machine may be assumed. The popular appeal of Tayloristic ideals have long supported managerial control over daily operations, especially in situations when performance falls beneath expectations. Employees who are considered mere 'cogs in the machine' can be disregarded as 'broken parts' and easily replaced by others seeking to be employed. This entrenched metaphor is a fragile framework that is ill-equipped for today's challenges. In John Hagel's review of Taleb's most recent book, Antifragile, we're reminded to "harness the power of randomness, volatility and extreme events to help us grow and develop more of our potential." Hagel points out one of Taleb's key arguments, that "unexpected events are by their very nature unpredictable" and that models attempting to anticipate and predict Black Swan events before they happen are a "fool's errand" that offers nothing more than a false sense of security. Black Swan events disturb the mechanistic-view that has long comforted managers with predictable outcomes. In order to maximise the value of business intelligence, managers should model their organisations after what Hagel and Taleb see as "adaptive or evolutionary systems that become better and reach even higher levels of performance as a consequence of encountering and overcoming challenges." The choice, in the words of Taleb, is between a cat and a washing machine. Anticipating change is not about avoiding today's challenges, but embracing them. Relying on the powers of prediction is as foolhardy as depending on machine-based models of reality. Life is unpredictable, use data to 'deal with it'. 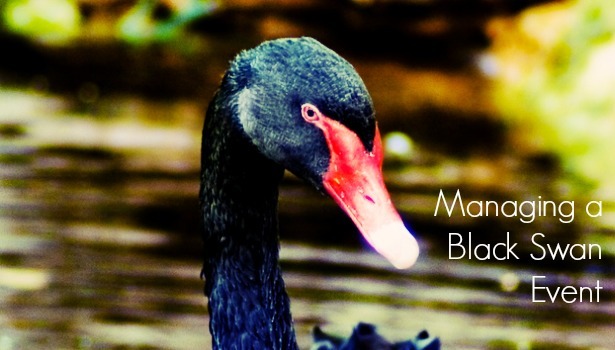 Considering the tough decisions that may be required of the day when a black swan strikes is not just the duty of chief executives, the responsibility is also managers who take the lead when outliers trigger waves of disruption. The antifragile response calls managers to seize their organisation's signals and make strategic choices available before tough decisions are required. Managers who enlist analysts and supporting players in learning from black swans and the failed response of 'ye olde machine', will make smarter decisions that support antifragility.